Many years ago, the intervertebral disc (Spinal Disc) was thought to have no nerve supply and therefore incapable of producing pain when irritated or damage. However, recent research has shown that the outer one-third or sometimes the outer half of the posterior annulus fibrosus is innervated by sensory nerves. Therefore, the outer layer of the posterior annulus fibrosus is capable of producing pain when it is damaged or irritated. Learn more about slipped disc or disc bulge. Traditionally, there were two major types of disc injury which can result in local spinal pain with or without radicular signs and symptoms. One of the injuries is disc herniation or extrusion. Disc herniation occurs when the center nucleus pulposus is no longer contained by the outer annulus fibrosus and is extruded through a tear in the annulus fibrosus. Nerve root impingements and spinal canal encroachment can happen as a result of disc herniation. 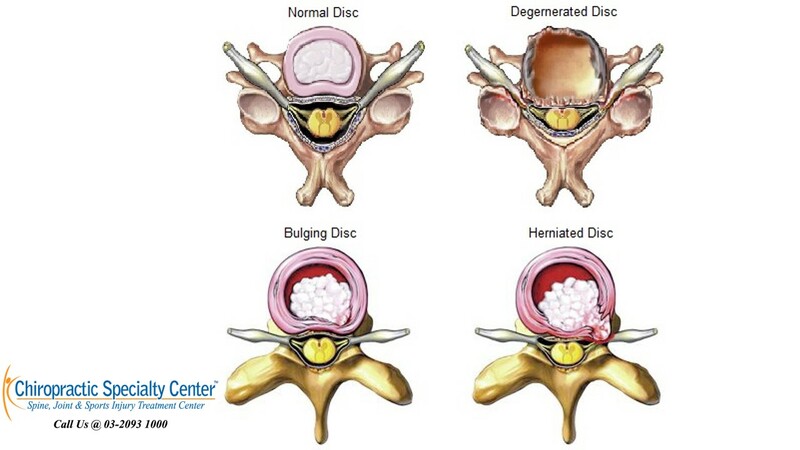 The other type of injuries is known as degeneration of the disc. Disc space narrowing, vertebral endplates degenerative changes and bone spur formation are the common imaging findings of disc degeneration. All these degenerative changes can result in the spinal canal or neural foraminal narrowing. Nerve root impingement or irritation due to spinal canal or neural foraminal encroachment can lead to pain and paresthesia at the site of injury. According to the recent research, a disc without herniation or degeneration is capable producing pain. This discogenic pain can be a result of torsional injury or compression injury of the annulus fibrosus. Traditionally, many that have a slipped disc (slip disc) are encouraged to have surgical interventions. While surgical centers and surgeons prefer surgical treatments, it might be better for you to avoid surgery as surgery has failed to show lasting improvements. The Chiropractors and Physiotherapists of Chiropractic Specialty Centers have the technology, skills, and expertise to treat and fix even the most severe slipped disc without drugs, injections or surgery. Best of all, the improvements you get are natural and long-lasting. If you have a slipped disc and live in Kuala Lumpur, call or visit us. In addition to our chiropractic center in Kuala Lumpur, we have others centers throughout the Klang Valley. Call us today to find more information about our centers and services, before surgery becomes your only option! For more details about our centers and service or inquiries on how to become our patient, please contact us at 03-2093 1000.